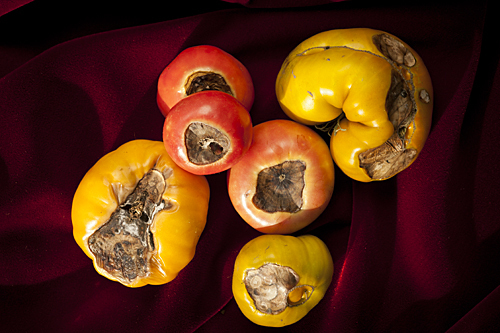 Blossom End Rot – Tomato Town organically grows heirloom tomatoes in the greater Kansas City area as well as Johnson County, Leawood, Lenexa, Olathe, Shawnee, Merriam KS, Independence MO and Kansas City Missouri, KCMO. Varieties include: Cherokee Purple, Brandywine, Stupice, Carbon, Black Krim, Black Cherry, Yellow Pear, Absinthe and Aunt Ruby’s German Green. Gardeners are no strangers to adversity, but we’ve become a little discouraged by the streak of blossom end rot. The excitement of reaching for a blushing beauty is crushed once it is plucked from the vine. As you can see, we’ve had quite more than a few victims. Farmer T insists that we can’t count fruit damaged by insect or disease, so these tomatoes will be lost to history. Thankfully, judging from the healthy fruit currently on the vines, this trend may be on its way out. This entry was posted on Thursday, July 21st, 2011 at 6:23 am. It is filed under Garden Advice. You can follow any responses to this entry through the RSS 2.0 feed.